What I love so much about Japan is the rapport between nature, history, and spirituality. The strong connection between the three can be felt throughout the Kansai region, especially on the Kii Peninsula, but one of the finest examples of this balanced relationship is at Nachisan, a sacred mountain site. Nachisan (Mt. Nachi) is a haven for worship and nature appreciation, a quality that has made it a major destination on the Kumano Kodo pilgrimage route. The Kii Mountains have long been considered a place where gods reside peacefully among nature, a belief that brought together Shinto and Buddhism at Nachisan. The symbiotic relationship between the two religions can be seen in the mountaintop complex housing buildings of both faiths, as well as the mutual worship of the surrounding landscape and its resident deities. There are plenty of interesting places to visit at Nachisan, as Mt. Nachi is one of the most sacred areas in Japan. In addition to important shrines and temples, there are also many beautiful natural attractions like waterfalls and forested hiking trails. Excited to explore this special site, I quickly dropped my luggage at my hotel in Katsuura then immediately boarded the bus to Nachisan. I decided to get off at the Daimon-zaka stop, then explore Nachisan by foot. Here’s a look at how I spent a wonderful afternoon visiting the main attractions of Nachisan! The Daimon-zaka Slope is the entrance to Nachisan and part of the Kumano Kodo pilgrimage route. I thought there was no better way to experience the sacred atmosphere of Nachisan than by walking the Daimon-zaka. This 600 metre path of 267 stone steps is surrounded by a forest of centuries old cedar trees and I welcomed the quiet contentment I felt as I walked up the slope. Marking the start of the trail are the Meoto-sugi “Husband and Wife” cedar trees, standing tall after 800 years. Soon after I came to the Tafuke Oji Shrine, a stone marking the place where pilgrims would worship trees and local deities. This was the last Oji shrine pilgrims encountered on the Nakahechi route of the Kumano Kodo. Walking the Daimon-zaka Slope was a great introduction to what I would experience the next day when I hiked the Ogumotori-goe section of the Kumano Kodo. If you don’t want to do a long hike but still want to sample part of the Kumano Kodo, then make sure you walk up the Daimon-zaka Slope to Nachisan. At the top of Daimon-zaka, I reached a staircase leading to the shrine and temple buildings of Nachisan. I started my visit at Nachi Taisha, one of the most important shrines in the Kumano area. Kumano Nachi Taisha is one of three ancient shrines known as the Kumano Sanzan. The shrine was established for worshipping the nearby Nachi-no-Otaki waterfall (Nachi Falls) and has been a major pilgrimage destination along the Kumano Kodo for over 1000 years. Unfortunately for me, the main shrine building was covered up for restoration work, but I did get to see Kumano Nachi Taisha’s other vermillion-lacquered buildings, including the worship place for Yatagarasu, the three-legged crow that legend says guided Emperor Jimmu on his way to Yamato before turning to stone. Right next door to Kumano Nachi Taisha is Seiganto-ji Temple. The Shinto shrine and Buddhist temple were once joined together, operating as a single entity until the Meiji government forced the religions to be separated in the 19th century. Seiganto-ji Temple is the oldest structure in the Kumano area. Legend holds that the temple originated when an Indian monk built a hut at the spot where Kannon, the Goddess of Mercy, appeared to him during his spiritual training. The temple enshrines Nyoirin Kannon and is the first of 33 temples dedicated to Kannon on the Saigoku Pilgrimage. There are some statues and several buildings on the temple’s grounds, but the most iconic structure is the brilliant three-storied pagoda. This pagoda was built in 1971 to mark the 300th anniversary since the original one burned down. Seeing the pagoda backed by Nachi Falls was one of the most beautiful scenes I witnessed during my three trips to Japan. In fact, it was this view that inspired me to visit Nachisan. I fell so in love with this spot and took countless photos of the pagoda at different times of day, capturing it in changing light. I spent a lot of time sitting here simply staring at the view because it encapsulates the essence of Japan so beautifully. The synergy between nature and man-made was palpable, leaving me endlessly captivated. After finally dragging myself away from Nachisan’s three-storied pagoda, I walked down to Nachi Falls for a closer look. Nachi Falls are Japan’s tallest waterfall, dropping 133 metres down a rock face framed by evergreen forest. 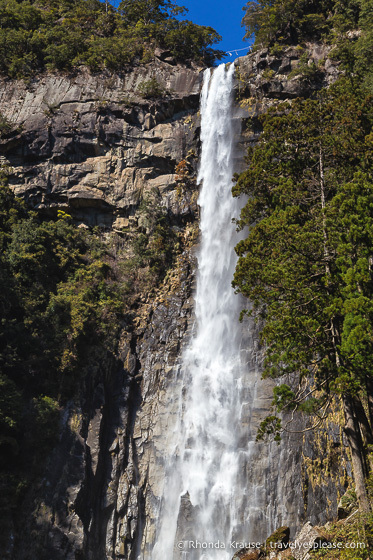 The falls can be viewed and worshipped from Hiro-jinja Shrine, an auxiliary of Kumano Nachi Taisha, but no matter where you view it from, the waterfall is a sight to behold. At Hiro Shrine, there’s a viewing area close to the “water of longevity” in the fall’s basin. Look up and you’ll notice a shimenawa rope, indicating a sacred and pure place, hanging above Nachi Falls. It’s a Shinto ritual to change the rope every July 9th and December 27th. Nachi Falls has been a sanctuary since ancient times and is still used for ascetic training by monks who practice Shugendo, a blended religion that focuses on mountain worship. Nachisan is a standout location in the Kansai region, an area full of photogenic and compelling sites. Much like neighbouring Koyasan and Yoshino, there’s a harmonious blend of nature and spirituality, a unity that I deeply appreciated. Mt. Nachi was a pleasure to visit for many reasons, but I especially liked how there were a variety of attractions and experiences in close proximity. I got to hike a section of the Kumano Kodo, visit a shrine and temple, then admire one of Japan’s most beloved waterfalls. It was also nice that Nachisan wasn’t packed with tourists, like many of the places I visited on my first two week trip to Japan. Even though I experienced everything there was to see and do at Nachisan, I would visit again if I were in the area because that’s how much I loved it! Location: Nachisan is located near the southern end of Kii Peninsula in Wakayama Prefecture (part of the Kansai region of Japan). Getting There: The Nachisan area can easily be reached by train from Osaka, Nagoya, and the Kansai Airport. The most convenient place to stay for visiting Nachisan is Katsuura (a.k.a. Nachi-Katsuura), so you’ll have to disembark at Kii-Katsuura station. If coming from Nagoya on the JR Nanki limited express train (like I did), Japan Rail Pass holders will have to pay a small supplement since the train uses a section of track owned by another railway company. Getting Around: Nachisan can be reached by public bus from Kii-Katsuura Station and Nachi Station in 20-30 minutes, depending on where you get off. It makes stops at Daimon-zaka, Nachi Waterfall, and Nachisan. Here is the bus timetable for Nachisan and if you want a route map and timetables for the surrounding area you can find them here. Planning Your Visit: If you don’t mind walking and are capable of doing stairs, I recommend getting off the bus at Daimon-zaka and walking up the slope to Kumano Nachi Taisha Shrine and Seiganto-ji Temple. From there, you can walk to the pagoda then downhill to Hiro Shrine and Nachi Falls. After your visit, catch the bus back to Katsuura from the Nachi Falls stop. You can also do this route in reverse if you prefer more downhill steps, but either way there are a lot of stairs. If you’d rather not walk so much, you can take the bus to Nachi Falls, then re-board it to Nachisan stop where you can then walk up to the shrine-temple complex and down the Daimon-zaka. Admission Fees and Hours: It’s free to enter the grounds but there is an admission fee for the treasure hall, pagoda, and viewing platform at Nachi Falls. Kumano Nachi Taisha Shrine is always open (except for the treasure hall which is open from 8:00 am- 4:00 pm). Seiganto-ji Temple is open daily from 8:30 am- 4:00 pm. The Nachi Falls viewing area is open daily from 7:00 am- 4:30 pm. Amenities: There are restaurants, souvenir shops, and teahouses in Nachisan. For your convenience, here is a list of hotels in Katsuura. Please consider booking your Nachisan accommodations through the included link. It costs nothing extra and helps support this website. Thank you!